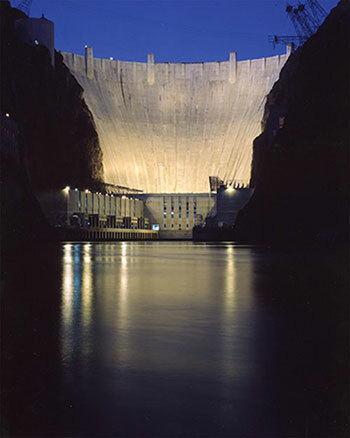 Hoover Dam - Open to the public everyday from 5:00 a.m. to 9:00 p.m.
Hoover Dam Tours - Open everyday from 9:00 a.m. to 5:00 p.m. The information that you need to plan your trip. Here is where you will find a description of the tour, admission fees, directions and more. Hoover Dam Tours are closed two days per year in observance of Thanksgiving and Christmas Day. Buy Tickets for Hoover Dam Powerplant Tour - This link will open a new window that takes you to our partner site with Denison Parking where you can purchase tickets on-line in advance of your visit. Note: You can also purchase tickets at Hoover Dam in person, seven days a week (except Thanksgiving Day and Christmas Day.) 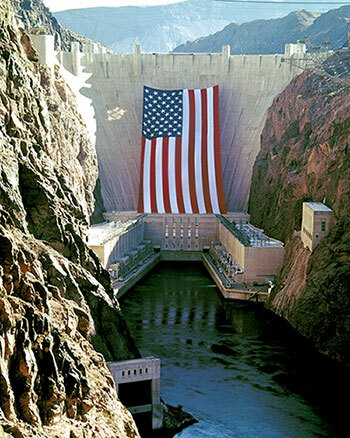 NOTE: Dam Tour tickets CANNOT be purchased on-line - they are available on a first come-first served basis and must be purchased in person at Hoover Dam. Major credit cards and cash are accepted. Click on image or link for large pdf version of map. Hoover Dam is located 30 miles southeast of Las Vegas. Click here for maps and driving instructions. 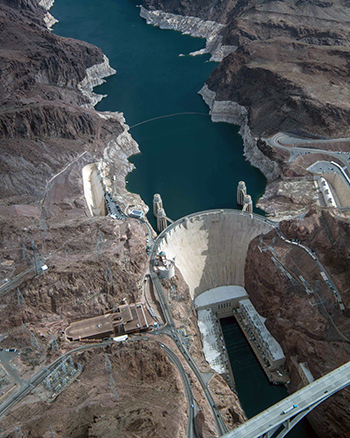 Hoover Dam is accessible from 5 a.m. – 9 p.m.
Powerplant Tour: 9 a.m. – tickets sold until 3:45 p.m. Visitor Center: 9 a.m. – 5 p.m. No entry after 4:15 p.m. Most passenger vehicles can cross the dam. All vehicles are subject to inspection at the Nevada Security Checkpoint. Visitors subject to vehicle inspection will be requested to open various compartments of their vehicle to include the trunk, hood, and storage areas. Visitors who decline vehicle inspection will not be permitted access beyond the checkpoint. Vehicles are prohibited from stopping on top of the dam, including the loading and unloading of passengers. Passengers can be picked up and dropped off using designated parking lots. Drivers must remain attentive to pedestrians at all times. Semi-trucks are prohibited from entering the dam site. Vehicles towing campers or pop-up campers will be required to open compartments or extend their pop-up for inspection. NOTICE: Offloading or disconnecting trailers, campers, or pop-up campers is strictly prohibited on Hoover Dam property. Firearms, Explosives and Fireworks are Prohibited at Hoover Dam per 43 CFR 423.30. 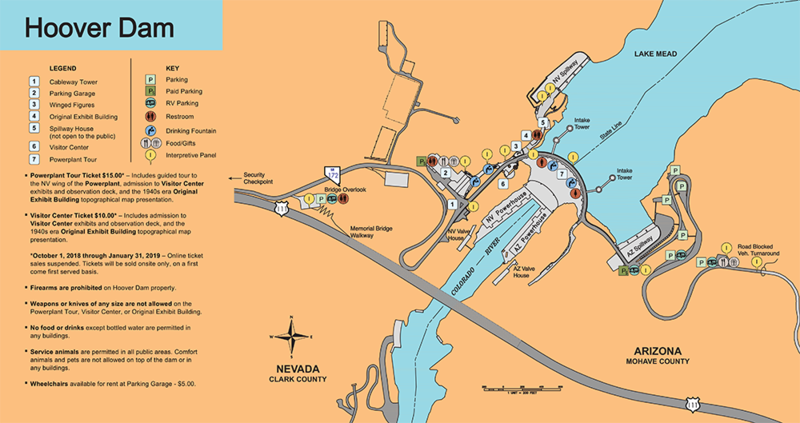 Visitors with prohibited items will be turned away at the Nevada Security Checkpoint. Visitors who are found to have firearms, explosives, or fireworks may be cited by Law Enforcement and instructed to leave Hoover Dam property. Flying drones is prohibited on Hoover Dam property per 43 CFR 423.41(g). Marijuana is prohibited at Hoover Dam per 43 CFR 423.44. Parking Garage: Open 8:00 a.m. – 5:15 p.m. $10.00 parking fee. Complimentary parking is offered for those with accessibility needs. Please show your disabled person sticker/placard to the garage attendant. Motorhomes and other high clearance vehicles (with dimensions greater than 10.5 feet high and 23 feet long) CANNOT park in the parking garage. Parking for high clearance vehicles is available on the Arizona side of the property (see map). Parking Lot 9 (Arizona side): Open 8:00 a.m. - 4:00 p.m. $10.00 parking fee. Parking available for high profile vehicles in non-covered marked spaces. Upper Lots (Arizona side): Free. The walk to the Hoover Dam Visitor Center from the Arizona lots is ¾ of a mile or more. Motorhomes and other high clearance vehicles (with dimensions greater than 10.5 feet high and 23 feet long) must use the designated lots located on the Arizona side of the property. There is no shuttle service at the facility. Service animals specifically trained to aid a person with a disability are welcome. Comfort animals and pets are not allowed on top of the dam or in any buildings. Animals cannot be left in vehicles unattended. Weapons or knives of any size (including pocket knives) are NOT ALLOWED in any Hoover Dam building. Food, canned drinks or drinks in cups are NOT ALLOWED in any Hoover Dam building. Water bottles are permitted. Visitors will be required to process through the security screening before purchasing Powerplant tour tickets. Visitors are required to remove all metal objects from their pockets and person. Visitors will be screened with a hand-held metal detector wand or may request a pat down in lieu of being handwanded. All personal items (purses, jackets, etc.) will be physically inspected by security staff. Any visitor with prohibited or dangerous items on their person will be instructed to return the item to their vehicle. A good portion of the Hoover Dam experience is outdoors, please plan for all types of weather. Tours available daily except for Thanksgiving and Christmas. Dam Tour $30.00 (Must be 8 years of age or older. This tour is not handicap accessible.) – Includes 10-minute movie on the history of Hoover Dam, a 1-hour guided tour to a platform, overlooking a 30-foot diameter penstock pipe, the Nevada Wing of the Powerplant, and a stop in an original inspection tunnel inside the dam. Also includes the Visitor Center exhibits and observation deck along with the 1940s era Original Exhibit Building topographical map presentation. Includes 10-minute movie on history of Hoover Dam, 30-minute guided tour to a viewing platform overlooking a 30-foot diameter penstock pipe and the Nevada wing of the Powerplant, admission to Visitor Center exhibits and observation deck, and the 1940s era Original Exhibit Building topographical map presentation. Powerplant tour tickets sold from 9 a.m. until 3:45 p.m. Persons with pacemakers or other implanted devices - Be advised that generators produce an electromagnetic field which may interfere with the operation of certain devices. Persons with Claustrophobia - Be advised the Powerplant Tour includes an elevator ride and walking through a tunnel. NOTE: Due to situations beyond our control, tours may be cancelled periodically with no prior notice. Includes admission to Visitor Center exhibits and observation deck, and the 1940s era Original Exhibit Building topographical map presentation. Tickets sold until 4:15 p.m. Public buildings close at 5:00 p.m. Visitor Center Tickets can be purchased at the Visitor Center or at the 1st level of the parking garage. The Powerplant tour, Visitor Center, and Original Exhibit building are accessible for visitors with wheelchairs, scooters, or other mobility devices. Major credit cards and cash accepted for ticket purchase. America the Beautiful – National Parks and Federal Recreation Lands Pass (replaces the Golden Eagle, Golden Age, Golden Access and National Parks passports) discounts are NOT ACCEPTED for Visitor Center, or for the guided tours. This pass is used for admission to parks and facilities that receive benefits and revenues from the Federal Lands Recreation Enhancement Act (like Lake Mead National Recreation Area). Hoover Dam is entirely self-funded and does not receive revenues through this Act. Sign language interpretation can be requested for the Dam tour with a minimum of 14 days advance notice, by contacting 702-494-2518. Guests will be contacted prior to their visit to verify arrangements. Tour scripts are available upon request. Wheelchair pick up/drop off area on first floor of the parking garage. Wheelchairs are available for rent in the Parking Garage for visitor use. There is a $5.00 charge. See map for other amenities. Hoover Dam is a relaxed, family-oriented environment. We suggest you dress comfortably, wear comfortable walking shoes and check the local weather report before visiting the Dam. Tours into the Dam involve short trips in tight quarters where physical contact with others is likely. The week of Thanksgiving and the week after Christmas are very busy times. The least busy time of day for tours is from 9 a.m. until 10:30 a.m., as well as 3:00 p.m. until 3:45 p.m. To enjoy the site entirely, we recommend visitors arrive by 2:00 p.m. The dam closes at 9 p.m.
Traffic around the dam during holidays and weekends can be extremely heavy with long delays on the roadway. · Shirt and shoes are required when in the Visitor Center or on tour. · Clothing with objectionable material, including obscene language or graphics. · Excessively torn clothing or loose-fitting clothing which may drag on the ground and create a potential trip hazard. · Clothing which, by nature, exposes excessive portions of the skin that may be viewed as inappropriate for a family environment. · Clothing with multiple layers are subject to search upon entry.